I opted for this array over multile bi-directional Beverages. Performance is comparable to my 820-ft EU Beverage, but this array is "steerable" in eight directions. It is a very quiet antenna. Since it exhibits good F/B directionality (RDF or "Receive Directivity Factor") through 7MHz, I use it almost exclusively for 160m thru 40m RX. Further, the SAL-30 compares favorably as a receive antenna on 40m with a SteppIR DB18E at 30.5 meters fed with 7/8" hardline. The SAL-30 is fed with inexpensive RG-6 coax. Relay control and pre-amp power is fed through the coax using DC injection. There is no need for separate control cables. In my case, the antenna is 120 meters from the shack. Here are several YouTube videos that demonstrate the antenna's performance. 4) Receive Directivity Factor examples (When the signal disappears I "FLIP-ed" the SAL-30 to the opposite direction. In some cases I "turned the array" through the compass points. In some of the videos you can see the SAL controller LED display rotate. ): JH1GNU on 80M, HL5IVL on 160m. In the following video you can tell how remarkable the antenna is on 40m. In the video of K5P you will notice the signal completely disappear when the antenna is "FLIP-ed." Palmyra, of course, is to the west, as you can tell by the green LEDs. K5P on 40M RTTY. The controller provides "UNI" and "BI" modes. The former is uni-diretional, while the latter adds another loop to provide equal RDF in two diretions. The "BI" mode provides a slight bit more gain but, of course, does not reject unwanted signals as well. Tuning is accomplished by moving ferrite bead couplers along the base leg of each of the four loops, tuning for maximum Receive Directivity Factor (F/B). Symmetry allows you to tune just one leg and apply those measurements to the other three loops. Here is a picture of the coupler and the associated "line" that runs back to the switching unit/controller and preamp. I use clothes-pins and electrical tape to hold them in place. I tuned the antenna using a RigExpert AA-54 Antenna Analyzer in "signal generator" mode on 1.82MHz. I used a 2m whip with the AA-54 on a wooden step-ladder placed 61 meters (200 feet) from the base of the SAL "legs" I was tuning. The following table verifies that a distance of 61 meters from the outside angle of each loop provided the best results. Placing the signal source any closer obfuscates the reading. (Of course a steady-signal, appropriately-distanced, BC band AM station can provide a good source, as well.) Since the antenna is symmetric you only need to tune one leg, but I tuned a second leg to make sure the symmetry proved out in tuning measurements. That was, in fact, the case. 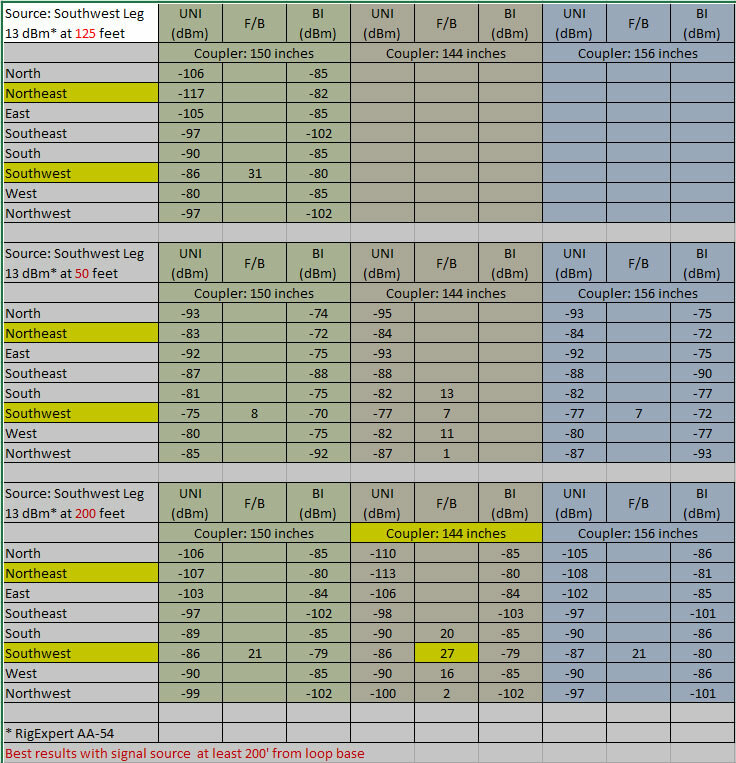 As shown in the following table, I found the optimal coupler distance to be 144 inches (366 cm) from the mast/right-angle. At that distance I measured 27 dB F/B (RDF) in "UNI" (UNI-directional mode). This was the best RDF I could obtain, with extensive tuning. Signal strength improves in "BI" (BI-directional) mode but you sacrifice RDF. You can download an Excel copy of the table here. In the U.S. you can find AM Broadcast stations suitable for tuning purposes using the FCC look-up tool. 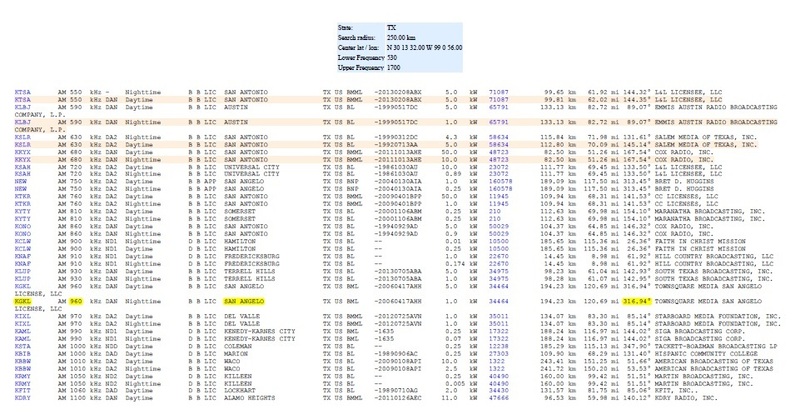 Here is one page of the result of a query I did for my QTH, near Fredericksburg, TX of stations within 250km. A PDF version of the complete table is here. We have an over-abundance of White-tail and Axis deer in the area. I use yellow "caution" tape tied to the horizonal legs of each loop and at the outer guy anchor points to make the antenna more visible/avoidable. In two years I have had only one instance of deer running into the antenna, and that was because I was shooting bottle-rockets at them and they scattered anywhere they could. I've watched them when our dogs chase them and they deftly avoid the antenna, with its yellow caution tape. Therefore, and despite the huge White-tail population in our part of the Hill Country, I see no need at my QTH, at least, to elevate the base of the SAL so that the bottom/horizontal leg is above "antler-snagging" height. It makes installation a lot easier if the base is lower because of the need to balance the pole as you extend it section by section. I do not know whether raising the entire antenna has an effect on its performance, but construciton calls for it being mounted at "ground level." That places the botton leg (base of a right triangle) 1.22 meters above the ground. In practice I've read about all sorts of installations on the SAL reflector, on uneven ground and mounted so the base is up to 2.5m above ground. Array Soultions provides a "stub" on which to place the bottom section so it doesn't slip around. I used a milk carton and some Sakrete to make a 10cm square concrete pad, sunk a centimeters in the ground in which to "plant" the stub. I used 1.22 meter pieces of 5/8" (#5) rebar for the guy-line anchor points, both inner and outer. The central support pole/axis is guyed at three points, the top (by the loop wires, themselves), anld two more evenly spaced points below that with heavy, black, U/V-resistant rope. They attach to square spacers that fit between the support sections. The top guys attach to the outer guy point/anchor, while the lower two attach to anchors half-way out to the outer anchors. The point at which the bottom part of the loop interesects with the guy ropes is a good place to secure the bottom loop leg to keep it as parallel as possible to the ground (if that's important to you). I surrounded the guy rope and anchor points attachment points wtih corrugated French-drain pipe and yellow caution-tape to protect from "trip damage" from both two and four-legged animals. The central control box mounts at the top of the first mast section, wehre the loop triangle right-angle is. I use heavy-duty cable ties to hold it in place. The phasing line just hangs from the controller. The control box contains the relays necessary for phasing (see the video above) and a preamp. Again, 12-V power for both the relays and preamp uses DC injection via the RG-6. The yellow/white twisted pairs from the four couplers are visible entering the control box at the bottom. The phasing delay line is coiled and hangs from its respective jacks on the controller. This view provides a good look at the insulators use to keep the vertical part of the loops aligned. This is the bottom insualator where the loop right-angle is formed.